We are constantly hearing that we eat too much sugar but people are confused. Here are some facts about sugar to help you make sense of it all. One: If you see any of these words on an ingredients list then you are looking at “added sugar.” Being “natural”, “brown” or “raw” does not make it any better. Adults should stick to no more than 7tsp added sugar/day and kids a bit less at 6tsp/day. Agave nectar, evaporated cane juice, malt syrup, brown sugar, maple syrup, syrup, fructose, high-fructose corn syrup, crystalline fructose, dextrose, sucrose, cane crystals, fruit juice concentrates, fruit juice, molasses, cane sugar, glucose, maltose, raw sugar, sugar, corn sweetener, corn syrup, honey, invert sugar. Two: Food labels show the amount of carbohydrate and the amount of carbohydrate as sugar. Choose foods with <5g sugar/100g. Three: Although fruit juice and smoothies contain free sugar you can still have one small 150 ml glass of either but not both as one of your 5/day. If you are aiming for up to 10 portions of fruit/veg daily then I tell my clients to include up to 2 x 150 ml glasses/day. If you are having 10 portions of fruit/veg each day then you are a star. I am currently making it to 8 most days! Four: Naturally occurring sugar in whole fruit and milk/milk products comes with lots of other useful nutrients so there is no need to remove it from your diet. Be careful with dried fruits though as these are a very concentrated source of sugar and it’s easy to eat a large amount without realising. 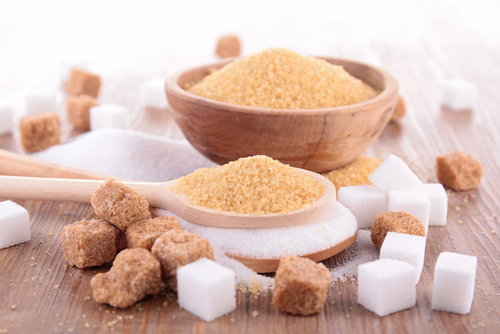 Five: Some foods have very small amounts of sugar added. For example ham. If you find “added sugar” low down on the ingredients list this is not where you should be focussing your attention in terms of lowering your sugar intake. You are not trying to get every grain of added sugar out of your diet. This entry was posted in Balanced diet, Carbohydrates, Sugar and tagged added sugar, fruit, sugar by Stephanie.fade. Bookmark the permalink.